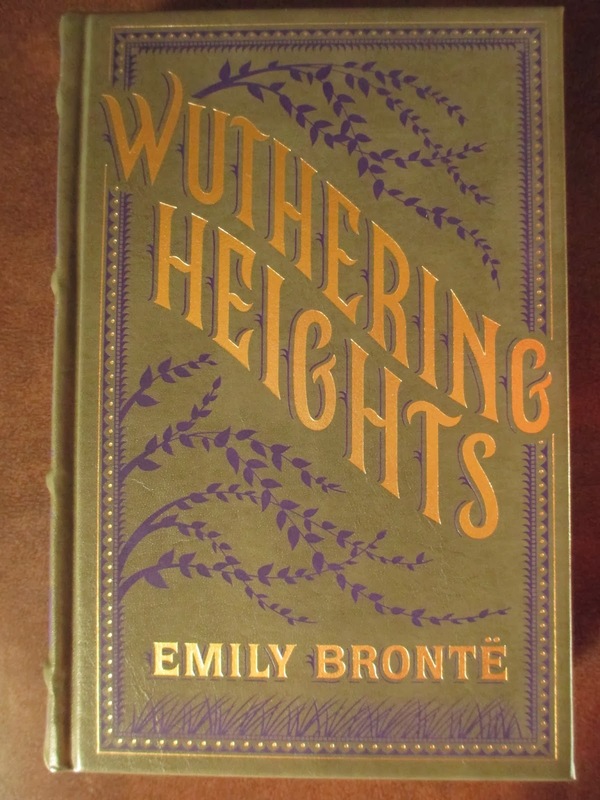 1) New Copy of Wuthering Heights - Just have to expand my leatherbound Barnes & Noble classics collection every so often, this time with at least my third copy of this book. 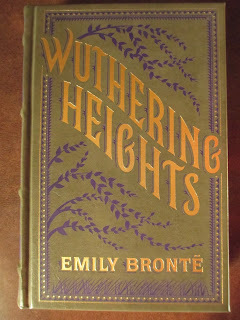 Aren't the branches such a pretty touch to this cover? 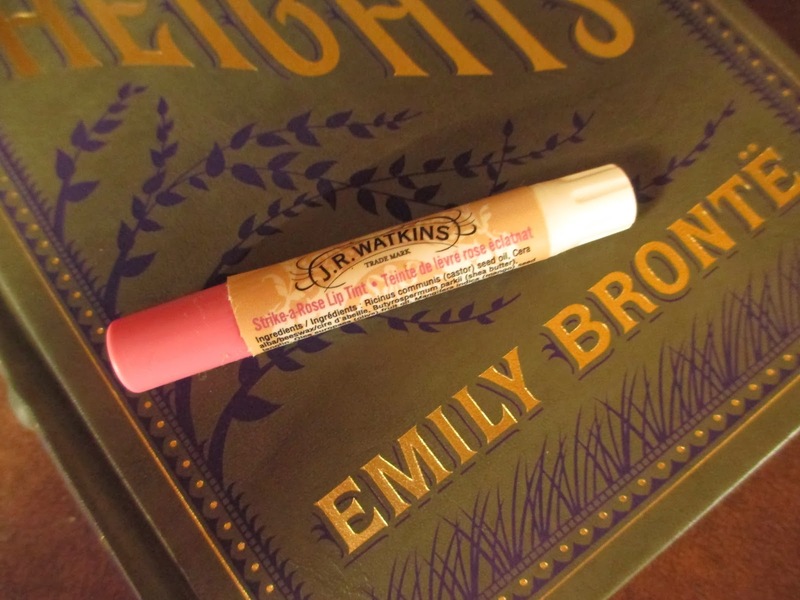 2) J.R. Watkins Lip Tint - This is very similar to the Burt's Bees lip shimmers. Like Burt's Bees, there are no iffy ingredients. This one might be a little grainier, though. But it has a nice minty flavor, adds a touch of color, and is low-priced. It isn't my absolute favorite, but it's alright. 3) Trader Joe's Candy Cane Green Tea - Especially for such inexpensive tea, this stuff is wonderful. I wondered how well the peppermint would blend with the green tea, but somehow it works. It tastes sweet along with the mintiness, just like a candy cane; the green tea works because it doesn't give off the strong flavor that black tea would. It's the perfect holiday tea; I love it. Also available right now is the Vanilla and Cinnamon Black Tea, which I don't like nearly as much; it almost tastes dull. 4) Tarte Lights, Camera Flashes Mascara - Sephora was selling a Tarte eyelash curler in a set with a sample-sized edition of their new mascara, which I really wanted to try. It's a good mascara, but not quite my favorite. The liquid is thick, so it really piles onto your lashes, which is good. But somehow the brush (which looks like a good shape) separates lashes a tad too much. So maybe with a slightly different brush it would be better. 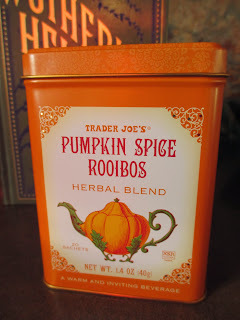 5) Trader Joe's Pumpkin Spice Rooibos Tea - Here is a November tea. It smells very much like pumpkin pie--perhaps too much. Fortunately, though, it has a more calming taste. There is just a touch of pumpkin and spices, along with the warmth of the rooibos. I don't usually like rooibos that much, so I was surprised that I did enjoy this tea. Instead of being thick, it's fairly delicate. 6) Fresh Sugar Favorites set - Oh, Christmas Time; Oh, Christmas Time; I bought myself a present. I just couldn't resist; I've been planing to buy this for months. If you've ever used Fresh's Sugar lip products, you know how amazing they feel on your lips. Soft, sweet, luxurious. And since they can get messy if you're not careful with them, I like the small size that's in the Christmas sets. I'm still not a fan of the purple in Berry (I'll probably use it to wear at night) and the red of Passion has to be reserved for occasional days. Cherry is a nice sprightly red alternative, and Petal is a gorgeous light shade of pink. Honey is still a nice casual, light, warm shade, and I had almost forgotten how beautiful Rose feels. Rose might be my favorite. 7) Mrs. Bridges Christmas Preserve - Oh, World Market, how I love thee. This jar of preserves tastes like Christmas: berries and spices, richness and fruitiness. It's a way of spreading fragrance onto toast. 8) Bite Beauty lip primer/liner - When winter comes and I do my occasional red lip, I really feel like I need a lip liner. But I didn't want to get one color that I wouldn't be able to use with multiple products, so I opted to try out Bite Beauty's colorless primer/liner. I'm still getting used to it and trying it out, but I think it does make my color last longer. 9) Banana Republic Skirt - Let's just pretend that I actually got this skirt at Banana Republic (actually, I don't really care; if I did, I wouldn't have said anything). Even though it's short, I feel like it has a cool weather look. I wore it with green tights, tall boots, a brown knit sweater, and a gold and dangly vintage necklace. 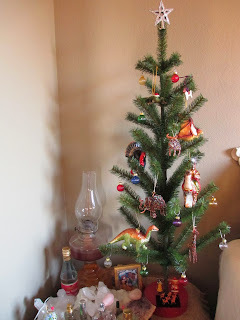 10) Christmas Decorating - I got a new, small Christmas tree this year; it looks colorful and happy with dinosaurs, a turkey, a lizard, beaded animals, a clay dog I made years ago, and a wise man on his camel.